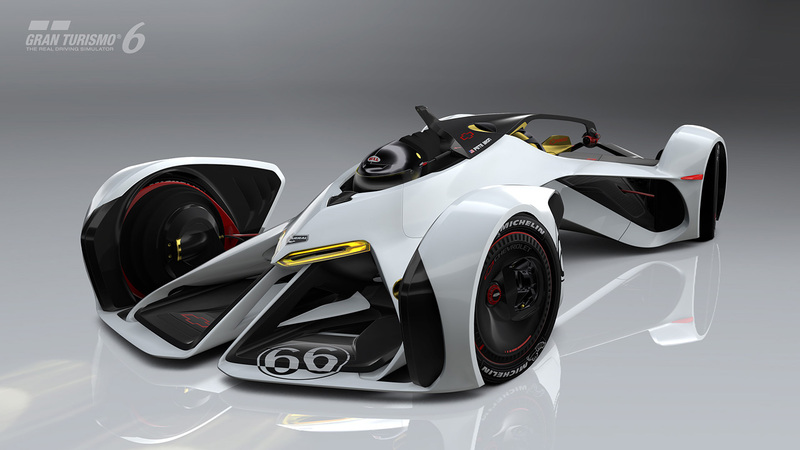 From Gran Turismo Web Site: Vision Gran Turismo is a project in which the world’s leading automotive brands develop concept cars for Gran Turismo (GT6) on the PlayStation PS3. Conceived as a “Garage 56” Le Mans Experimental Prototype, the Chevrolet Chaparral 2X Vision Gran Turismo is a look into the future of motorsports and inspired by the combined sensations of flying in a wing suit and a Moto GP race bike… an experience where the 2X pilot flies around the circuit, headlong, just inches from the race surface. The 2X’s Chevrolet power unit… thrusts itself down the track with laser pulse shock waves generated by an advanced propulsion system from Chevrolet. This entry was posted in Motor Racing and tagged Chaparral, Gran Turismo, GT6, Motor Racing. Bookmark the permalink.